High top Converse Chuck Taylors remain an athletic icon. On May 31, 1986, Doc Rivers was married in them — high-top pink ones, to match his bride Chris Campion’s wedding gown. On Nov. 21, 2000, Hosea Williams was buried in them — high-top red ones, to complement his blue denim bib overalls and red shirt as the Atlanta civil rights activist lay in state. And one starry night, Wilt Chamberlain scored 100 points while wearing the greatest basketball shoe of all time. 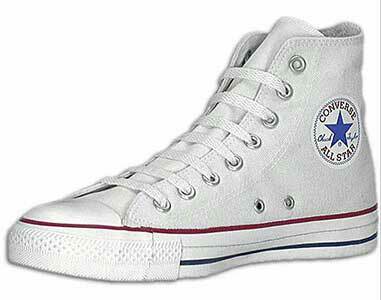 High-top, white canvas Converse All Stars. Remember? Remember the patch on the inside of each ankle? Remember the blue star, the words Converse All Star and Chuck Taylor’s script signature in blue? By any name — Cons, Chucks, Connies, All Stars — they were once the basketball shoe of choice. In this day and age of high-tech basketball shoes that routinely cost from $100 to $200 and sport more technology than NASA’s latest launch, in this year of the sneaker’s 85th anniversary let us now praise and recall Cons, which cost $9.99 a pair in the early ’60s and will forever remain in the memory of anyone who went backdoor in his, or her, Cons. “The star was the thing,” said Rick Majerus, the self-described fat nerd from Wisconsin who later walked on and coached for Al McGuire at Marquette. Majerus now coaches at Utah and still lovingly recalls the Cons of his youth. Majerus is now a loyal Reebok guy, paid by the company to dress his Utes in Reeboks. But you always remember your first pair of Cons. A couple of blocked shots slapped back in your face, by a leaper who was invariably wearing Cons, too. No matter. You no longer wore Keds, or P.F. Flyers. You were no longer a kid. You were a man. A hoopster. You wore Cons. Everyone did. Bill Russell and the Joneses, K.C. and Sam, and all the Celtics. Oscar Robertson. Jerry West. Willis Reed. Wilt wore them that March 2, 1962, night in Hershey, Pa., when he lit up the Knicks for an even 100. When Mavericks coach Don Nelson was coaching Golden State, he was married in the Warriors’ arena dressed in appropriate formal wear: a black tuxedo and black Cons, just like the ones Nelson wore as a Celtic. For decades, the Kentucky Wildcats wore Cons, until they went Nike in the late 1990s. Even after Converse expanded from classic white and black Cons to technicolor, some Kentucky fans wore special Cat-edition blue denim Cons (price: $85) when the Wildcats won the 1996 NCAA championship. Magic Johnson and Larry Bird once wore Converse — canvas Cons as little Midwestern boys, later leather high-tops that earned them millions from the company after they turned pro in 1979. By then, Dr. J was already a high-profile spokesman for Converse, which he first wore as the teenage Julius Erving at Roosevelt High School on Long Island, N.Y. Lifetime Cons wearer Ira Berkow wore them, too. Now a columnist for the New York Times and one of the most prolific and esteemed basketball writers, Berkow swore by Cons growing up in Chicago, while playing junior college ball and for years in pickup games at the Vanderbilt YMCA in Manhattan. So did Chuck Taylor’s feet, that day in 1921 when the salesman and hoopster walked into a Converse sales office in Chicago and asked if the company could make a better basketball shoe that didn’t leave his feet aching after games. The first Converse All Star had debuted in 1917, thanks to Marquis M. Converse, who founded the Converse Rubber Co. in North Reading, Mass., in 1908. Enter Taylor, who’d played for teams back in Buffalo and New York, and was working and playing for his employer’s company team, the Akron Firestones. The rest of his story became history: Converse hired Taylor to do basketball clinics and sell Cons. The new-and-improved All Stars came out in 1922, with Taylor’s name added to the ankle patch in ’23. He became Converse’s “Ambassador to Basketball”, traveling throughout the country and the world, promoting hoops and Cons. By Wolf’s junior year in college, Ohio had switched to fancy new leather Adidas shoes. In an NCAA tournament game that season, Wolf was one of three Bobcats who held Notre Dame’s Austin Carr to 61 points, still the NCAA record for points in a tournament game. Surely, this was no accident. Surely, this would never have happened if Wolf and his buddies had still worn classic, canvas Cons. Alas, the Galloping Gaels had to, to the derisive hoots of opposing crowds. Alas, change came to the basketball shoe business: Aggressive new competitors for Converse, such as Adidas, Nike, Pony and Reebok. New-and-improved leather shoes that gave more support than canvas All Stars. In 1984, Nike signed an NBA rookie named Michael Jordan to a contract. The rest is sport shoe history. Plenty of people wore classic Cons, just not to play basketball. Richie Cunningham on “Happy Days.” The Fonz. Queen Latifah. Springsteen. Kurt Cobain and Nirvana. Fashion models on runways in Paris and New York. TV’s “Dennis the Menace” and a truly menacing Dennis — Dennis Rodman, who later became an ill-fated spokesman for Converse when the company fell into decline in the late 1990s and also disastrously signed Latrell Sprewell to hype Cons. When Atlanta attorney Candace Fowler, now a partner at Kilpatrick Stockton, was a law student at Emory, her footwear of choice was a pair of high pink Cons. She also had a pair of high blacks, for formal occasions. When her Emory classmate, Carol Naughton, and her husband Tim (a long-time Cons devotee) had their daughter, Fowler bought little Maggie an infant-sized pair of pink Cons to commemorate her birth. But nothing could save the classic Con, not even that historic day in 1989 when an absurd Atlanta Hawks draftee named Jorge Gonzalez — a 7-foot-6, 413-pound Argentine — received his first pair of genuine basketball shoes. Those leather Converse were officially size 19EEEEE*. Why five E’s, with an asterisk? But not enough to keep Converse afloat. In March, 2001, with sales plummeting, Converse filed for Chapter 11 bankruptcy and agreed to sell its assets to another company. That same month, Converse shut down its production plant in Lumberton, N.C., and two others in Mission, Texas, and Reynosa, Mexico. Fearing that classic Cons would no longer be available, a baker from San Francisco called the Lumberton plant and ordered six pairs. Fortunately, even if few folks these days wear Converse All Stars to play basketball, they’re still manufactured overseas and available in U.S. stores. At Walter’s on Decatur Street in downtown Atlanta, a pair of classic Cons costs $29.95. A pittance for a piece of hoop history, ingrained in the memories of millions who, like Rick Majerus, will never, ever forget their Cons.